Tired of Fido Stealing Your Snacks?. Tired of Fido Stealing Your Snacks? Solve the problem with a little LEAVE IT training. Have you ever lost your lunch to the dog? Are your toddlers in danger of having every cracker swiped from their hand when the four-legged thief is around? You might want to teach your dog the meaning of the words "leave it." Teaching your dog that something is off limits (unless you grant permission) can save considerable frustration and embarrassment. Dog's are often at the perfect height to steal children's snacks directly from their hands. They are also very keen at swiping your sandwich from the plate if you set it on the coffee table and happen to walk away for a split second. They are savvy at snatching any delectable tidbit in their reach. Not only does it apply to the food around our homes, the behavior applies when we're walking and they come across some discarded fast food bag, garbage that has spilled over, or even road kill. Not only is it gross when they get into these things, it can be dangerous. Teaching our dogs to move away from an item of interest and not proceed any closer (unless given permission) is a useful skill that might just keep your dog from getting sick or worse. When I teach this skill with an e-collar, it is amazingly simple and quick for the dog to understand what I want. Take a look at how fast this food motivated lab was able to comprehend not to touch until I determined if it was okay or not. 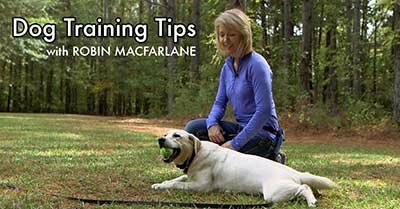 Next Article: Can e-collar training help you around the house? Pull-Quote= Lost your lunch to the dog? Fix it with LEAVE IT.